With a stay at Honeybee Country Accommodation in Kandanga, you'll be 9.7 mi (15.6 km) from Dingo Creek Vineyard and 12 mi (19.4 km) from Shiann Alpacas. The front desk is staffed during limited hours. Free self parking is available onsite. Located in Sassafras, this cottage is within a 15-minute drive of Dandenong Ranges National Park and Puffing Billy Steam Train. Free self parking is available onsite. 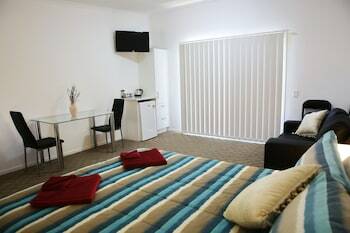 North Sydney Furnished Apartments offers accommodations throughout the area in North Sydney. Free self parking is available onsite. Located in Lovedale, Cottages on Lovedale is in a rural location, a 4-minute drive from Allandale Winery and 6 minutes from Hunter Valley Golf & Country Club. Free self parking is available onsite. With a stay at Gladstone Central Apartments in Gladstone, you'll be 4.9 mi (7.9 km) from Little Blue Lake and 18.5 mi (29.8 km) from Mt. William National Park. Located in North Mackay, Kooyong Hotel is within a 5-minute drive of Bluewater Lagoon and Caneland Central. Free self parking is available onsite.